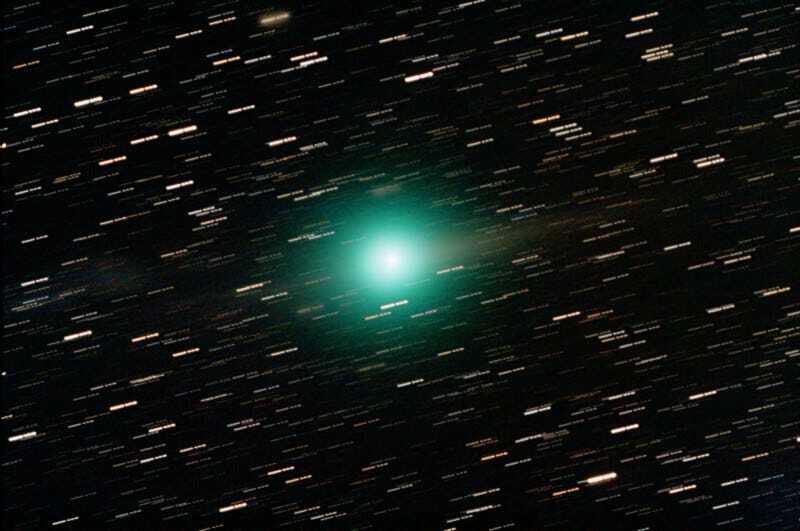 Comet Lulin won't be smashing into Earth, but it's going to swing by so closely in late February that you'll be able to see it with binoculars - and maybe even your naked eyes. This gorgeous photo of Lulin, discovered a little over a year ago, was taken last week at New Mexico's Caldera Rim Observatory by James Maxwell. Stars around the comet look a bit streaky because of the long exposure required to make the greenish comet pop like that - you can even see its tail and anti-tail (in front). According to Sky and Telescope, this photograph is a composite of "24 x 90 second exposures, totaling 36 minutes, tracking the comet." If you want to find out more about the best times to view Lulin check out Sky and Telescope's article about it.